Hi all - excited to join the community; after watching many youtube videos and reading the documentation I'm still a little confused about a few points that I'm hoping the community can assist with. I'm interested in making a high-res .JPG or TIFF image using images collected using my Mavic Air and Map Pilot. I have no interest in 3d models nor geo-referenced images, I'm just interested in the cleanest, most high-res image possible. The image will be used purely for personal reference and perhaps printing to paper (but primarily simply for personal reference). The area I'm interested in mapping is approximately 500 acres of forested land, with hills and drumlins rising or dropping no more than 50 meters from take-off point. My ultimate goal is simply to produde a high-quality .JPG or TIFF image (again, no 3D, GPS nor geo-referenced points required). I have downloaded and played around with the latest version of Agisoft Metashape - and although I find it very easy to create 3d models from my photos captured using my Mavic Air and Map Pilot, I can't for the life of me seem to be able to export a high-quality .jpg or .tiff that resembles the standard of output that "mapsmadeeasy" provides for example. Any 2d rendering of my map looks "wonky" and I'm sure I'm doing something wrong but can't find any clear documentation pointing me to the right steps - anything I've found is tailored specifically to 3D or geo-referenced exports. The 2d textures I have exported look like a bomb was dropped on my environment even though I have very clear data to work with. Any help greatly appreciated - I'm just looking for documentation or youtube/web tutorials that will get me started - appreciate any any all help provided! 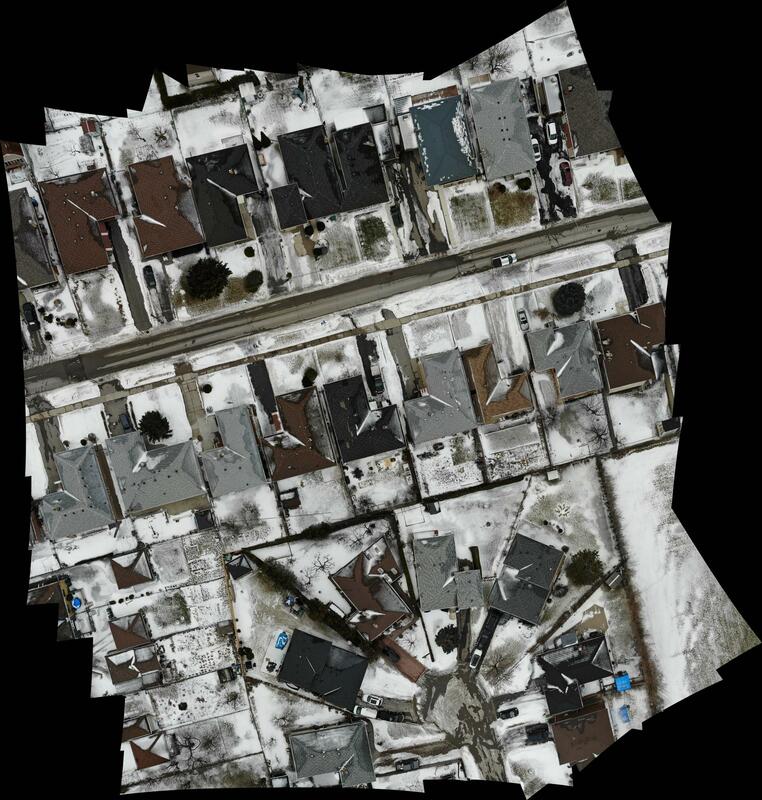 The test dataset is a residential area that I thought would be easier than a forested area to work with, very tiny in size (less than 2 acres). IMO Microsoft ICE (https://www.microsoft.com/en-us/research/product/computational-photography-applications/image-composite-editor/) would be a vastly easier and cheaper (it's free) solution for your needs. Took 3 clicks and 5 minutes of processing to stich your pictures. Thanks Mak, really appreciate your reply! I'm going to purchase Metashape for it's 3d capabilities so was hoping to use the same software, but if this is free and easier to accomplish my 2d needs then I'm fine with 2 apps. Thanks again for your fast reply mate!